During the Rev. Dr. Taylor’s sermon on the day of the consecration of the new Grace Church on March 7, 1846, he said “my object is to ask of you to give me the means of building, and preparing for the most efficient and the most immediate operation, Grace Church Chapel.” Taylor recognized that Manhattan’s population was already moving past the borders of his parish. The $8,000 organ by Stambridge had already been installed at this point. “The wheel of the organ is to be turned by a running stream of water, a new style, and one which it is said will produce a greater evenness of sound. A peculiar feature of the building will be a beautiful series of memorial windows. The Church is to have a spire 185 or 190 feet high, and its cost, without the spire, will be about $130,000,” said the newspaper. The edifice was completed by December and its cost came in a little under The Times’ prediction at $120,000—over $1.8 million today. The church which was originally intended for the poor who could not afford pew rent now sat squarely among the mansions of some of New York’s wealthiest citizens. The concept of free pews for the poor had fallen by the wayside. On the Friday following the first service a public sale of pews was held at 7:30 p.m. 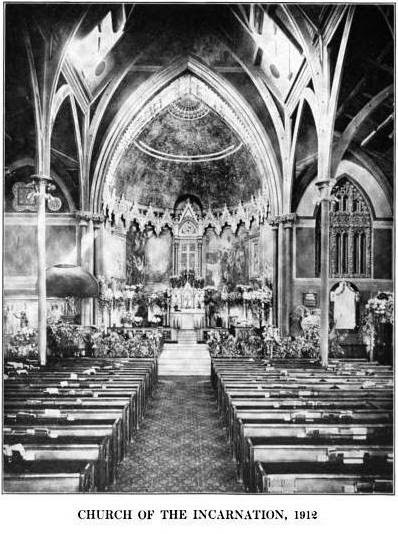 The New York Times remarked a few days later “We understand that one hundred thousand dollars’ worth of pews have been sold in the new Church of the Incarnation.” Additional monetary gifts of $25,000 had been donated and $20,000 in “premiums” had been received. “The success recorded above is believed to be without a parallel in the history of the Protestant Episcopal Church in this or any other city,” opined the newspaper. The 57-year old lawyer was, according to The New York Times “of nervous temperament” and “of highly respectable parentage.” He lived “in good style” at No. 518 Madison Avenue; a style more understandable when it was discovered her had swindled clients out of around $130,000. The same month that the messy affair was publicized, the church unveiled an 8-foot memorial to the Rev. Dr. H. E. Montgomery who died in 1874. Designed by architect Henry Hobson Richardson, it incorporated bronze panels by Auguste St. Gaudens. The Gothic memorial consisted of carved sandstone and marble and cost the donors $1,500. There was only one other memorial—a white marble tablet to Admiral Farragut—in the church. Dormers with leaded glass openings provide additional light to the interior. In 1882 Sexton James P. Tibbitts was concerned that the gas light burners were too near the ceiling. Workmen were brought in to lower the fixtures to prevent fire. The cautionary move produced the opposite result. Instead of sending an alarm to the fire department, Garvin ran to the house of Sexton Tibbitts at No. 1284 Broadway. By the time Tibbitts got to the church the fire had advanced. “When firemen entered by the chapel door the flames were bursting through the floor of the church behind the chancel and in the passageway leading from the chancel to the chapel,” reported The Times. Inside the building highly-expensive items were lost, like the $20,000 organ by Erben which had replaced the original; and the $15,000 memorial window in the west end of the church. “The roof of the church, with the exception of a small portion toward the front, was destroyed, but the walls of the building and the square tower on the south-west corner of the structure were intact. 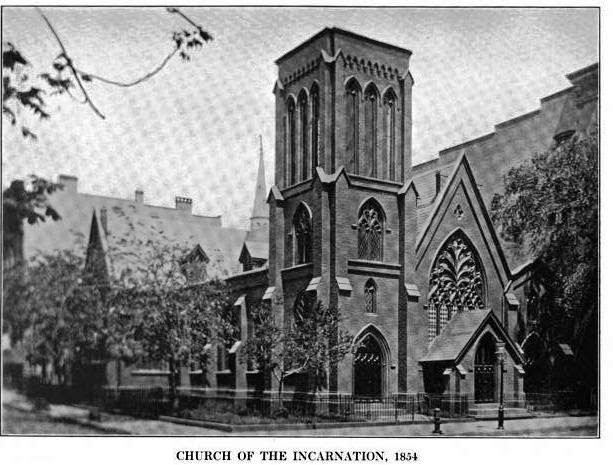 The chancel was burned out entirely, and the handsome fount and reading-desks were destroyed,” reported The New York Times. The damage was estimated at $50,000, all of which was covered by insurance. Rather than demolish the ruins and start over; the congregation opted to repair their beloved structure. On June 29, 1882 John L. Riker announced plans for the rebuilding of the church. “The walls are to be taken down and the structure rebuilt as it was before the fire,” reported a newspaper. Two days later the Real Estate Record & Builders’ Guide noted that the architects chosen for the project were brothers David and John Jardine. The church was enlarged “and improved,” and the construction was completed by Christmas. The cost of rebuilding and outfitting the building was $75,000. The architects respected Little’s original exterior design; however the “interior presents an entirely new appearance,” according to The New York Times on December 25, 1882. Although the church was reopened in December, it would take years to totally complete the renovations. In May 1883 the installation of the new organ was completed and a “complimentary concert” was given. William Garvin, the sexton who had discovered the fire in 1882, was an Irish immigrant. A widower, he lived with his two sons and a daughter in Brooklyn. On the evening of Saturday June 17, 1892 Rev. Dr. Arthur Brooks reminded him to lock up and be back early to open the church for services. When Sexton Jackson arrived at 10:00 on Sunday morning, he was surprised to find the choir waiting outside and the doors still locked. “Jackson opened the door with his own keys, and found Garvin lying dead in one of the aisles,” reported The Times. He had apparently suffered a massive stroke. The stained glass windows were executed by the Tiffany Glass and Decorating Company; two by La Farge; and seven by Henry Holiday in England. Helen Henderson was nearly alone in her opinions. The Times considered the Holiday windows “of the highest character” and said that La Farge’s windows “both well represent him.” The baptismal font was sculpted by Louis St. Gaudens and surmounted by a figure of John the Baptist. “This work is attractive in many ways, and marks a commendable departure from the inartistic architectural designs of fonts generally seen in other churches,” said the newspaper. In 1896 the trustees hired architects Heins & La Farge to enlarge the church by moving the rear wall back six feet. The renovation cost the congregation $5,000. The neighborhood around the Church of the Incarnation changed in the 20th century. The mansions of Madison Avenue were replaced by office buildings that towered over the Gothic stone structure. But the residential side streets of Murray Hill remained upscale and the congregation continued to be well heeled. A mid-century postcard depicted the impressive church. A century after the rebuilding of the Church of the Incarnation, its age was posing a danger. In 1990 chunks of stone began falling off the building, prompting officials to erect scaffolding with mesh netting to protest pedestrians. The following year a $1 million restoration was initiated. The reddish tone of the brownstone reappeared after 127 years of city soot was removed. The roof and the masonry were repaired. Ornate iron gates protect to portico. Another restoration was conducted in 2014. Despite Helen Henderson’s pedantic rant in 1909, the Church of the Incarnation represents a treasure of 19th century architectural and artistic work. So I am always curious, if as you say the critic Helen Henderson was nearly alone in her opinions, why is she quoted and not the majority opinion? Seems that the minority opinion is given more weight than the majority, especially in this example where she is clearly wrong and thankfully forgotten. I have the pleasure of walking past this church every evening after work. The interiors, windows and towering steeple are quite beautiful. I presume the parish townhouse was a later acquisition? Contemporary critiques, good and bad, are part of the history of the building. We wouldn't want to simply ignore one side or the other, would we? Positive comments were included in this post. I think that including other views makes the story more interesting and well-rounded. The parish house was later, yes.